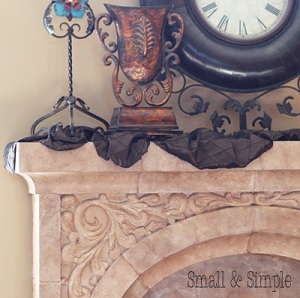 This scarf can be used on fireplace, table, or chair. You're going to love how simple it is to make your own table scarf. Adding a little bit of fabric can bring out texture and add dimension to your table-top display. Also, this simple scarf can double as a chair scarf! Just tie one around your kitchen chairs for a little dress-up. These scarves would be perfect for a bridal or baby shower or even a wedding. Taffeta and other fabrics may fray, so the next step will help prevent that from happening. 2. Next, you are going to change the setting on your sewing machine to a small zigzag stitch where the points of the zigzag are close together (I'm such a novice at sewing I don't even know the technical term for this!). 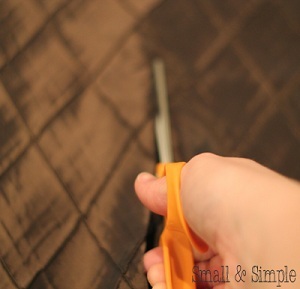 Sew the zigzag around all sides of both pieces of fabric, as close to the edge as you can get. This will help all of the edges from fraying. 3. Since you will still have some fraying, just take your scissors and trim all around the sides of both pieces of fabric, cutting close to the stitching you just made. 4. Take the two pieces of fabric and put one on top of the other, with the right sides facing each other. Change your machine back to a straight stitch and sew the two pieces together on one of the short ends. Use a ¼" seam to create one long piece of fabric. 5. If you are a little bit pickier than I am, you can go ahead and press that seam with a steam iron. This might take you an extra few minutes, so it will be a "Ten-Minute Scarf" instead! Now go tie your scarf around a chair and be amazed what you can accomplish in five minutes. You're good! 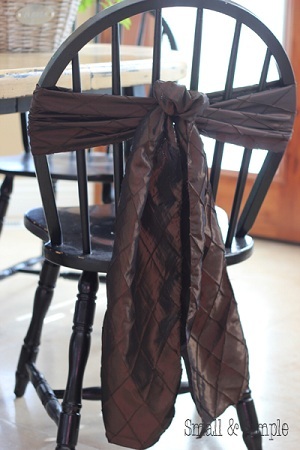 This is how the scarf looks tied around a chair.